Join us for a series of community service projects where we will love on individual families throughout the Atlantic Beach area. This includes mowing senior’s lawns, washing single mom’s cars and cleaning houses for those in need of some help around their homes. You can see a full list of all of the opportunities on the registration page, (just click below.) We will meet at Beaches Vineyard at 1:00 to pick up supplies and get directions to the different homes. This is a great way to meet people in our local community and truly be the hands and feet of Jesus. Love Jax volunteers will be working on building houses in support of Habitat for Humanity. Beaches Habitat for Humanity is a nonprofit, ecumenical Christian housing ministry dedicated to eliminating substandard housing in the Jacksonville Beaches. As an affiliate of Habitat for Humanity International, we work in partnership with local families and volunteers to build and rehabilitate simple, decent homes for qualified families in need. Tools and water will be provided, all you have to do is be sure to dress appropriately for working outside. Due to the weather, the beach clean-up has been moved to Friday. Beaches Vineyard will be teaming up with Beach Raker to help keep our beautiful beaches clean. On April 1st all ages are welcome to join us in walking the beach and picking up trash. We will be meeting at Seagate on the beach at 5:00 p.m and cleaning the north side of the beach. If the public parking lot is full we have been approved to park at the local church’s parking lot. Email Cassidee for more information. You are invited to help provide and serve meals for the guests of Gabriel House, an organization striving to provide affordable, temporary lodging in a “community of healing” environment for adult organ transplant and cancer patients, along with their caregivers who come to Jacksonville for medical treatment. We are looking for volunteers to make food and/or serve it to the residents. By clicking the Register button below you can see a list of the needed food stuffs. Food donations will need to be brought to Beaches Vineyard by Wednesday or noon on Thursday. Thank you! Email Cheryl for more information. Grades 1st-5th are invited to join us on Wednesday, April 3 at Beaches Vineyard at 4:30p.m to make desserts for the guests of Gabriel House. Gabriel House is an organization striving to provide affordable, temporary lodging for adult organ transplant and cancer patients, along with their caregivers who come to Jacksonville for medical treatment. We believe that making desserts is a great way for our kids to show Christ’s love in a tangible and delicious way. Email Cheryl for more information. This past December, the Beaches Rescue Recovery Mission, which provides a faith-based holistic approach to helping the hurting in our community, experienced a fire in one of their housing units that left the mission with considerable damage. In an effort to help with their recovery, the Beaches Vineyard Church will be volunteering to help paint and clean for our Love Jax week on Tuesday, April 2nd, from 6:30pm - 8:30pm. Volunteers should come dressed in clothing suitable for painting. Supplies will be provided at the Mission. For further questions, please contact Cheryl. You are invited to join the residents of Pablo Towers in a night of singing together and enjoying desserts. No musical talent is required, (lyrics will be provided ahead of time,) just a love for the elderly and a willingness to listen to their stories. This is a great opportunity for families to volunteer together. Each family should bring a dessert to share. Kids are welcome. Also, if you are not able to join us for the singalong, you may drop off a dessert at the church office that Monday between 9:30 and 4:30. Email Colton for more information. You are invited to come and hand out toiletry bags and spend time getting to know clients utilizing Mission House. We know that Jesus had a heart for the marginalized so we believe taking care of the homeless is something that God takes seriously. Mission House is located at 800 Shetter Ave, Jacksonville Beach, FL 32250. You must be 18 years or older to volunteer. Email Bobby for more information. Love Jax volunteers will be helping to clean up Helen Cooper Floyd Park, (Little Jetties,) in partnership with St Johns Riverkeepers. Gloves, grabbers and trash bags will be provided. You can read about St Johns Riverkeepers here or Helen Cooper Floyd Park here. Email Jessica Bunnell with any questions. St Johns Riverkeeper has asked if we'd be willing to "adopt a shoreline." It would be the Little Jetties that we are cleaning up on August 4th. Let us know if you'd be willing to be part of an ongoing clean up crew. Thank you for joining in Love Jax by volunteering to clean up the Little Jetties. As the event draws near you will be hearing from your team leader with more details. Thanks again! Love Jax volunteers will be working on building houses in support of Habitat for Humanity. Beaches Habitat for Humanity is a nonprofit, ecumenical Christian housing ministry dedicated to eliminating substandard housing in the Jacksonville Beaches. As an affiliate of Habitat for Humanity International, we work in partnership with local families and volunteers to build and rehabilitate simple, decent homes for qualified families in need. If you have any questions, email Joe Vieira. Thank you for joining in with Love Jax and volunteering to help with Habitat for Humanity! As the event nears you will be hearing from your team leader with more information. Volunteer Slots Filled Up - But there's always room for one more. Come join us in cleaning up our city! We'll be picking up trash at the Dutton Island Preserve on Tuesday, July 31st. This event is open to all ages. Please wear closed-toed shoes and bug spray. We'll meet at the first pavilion, near the rest rooms, at 6pm. Hope to see you there! Email Cassidee Drake with any questions. Love Jax volunteers will be providing and serving meals for the guests of Gabriel House, an organization striving to provide affordable, temporary lodging in a “community of healing” environment for adult organ transplant and cancer patients, along with their caregivers who come to Jacksonville for medical treatment. We are looking for volunteers to make food and/or serve it to the residents. Thank you to everyone who signed up to bring food and desserts! We have all of that covered now. All we need now is 1 more volunteers to help serve at Gabriel House. Food donations will need to be brought to Beaches Vineyard by 2:30 pm or Gabriel House by 3:00 pm. Thank you! If you have any questions, email Roberta Sedelmeyer. Thank you for joining Love Jax by volunteering to help out at Gabriel House. As August 2 nears you will be hearing from your team leader with more information. Thanks again! 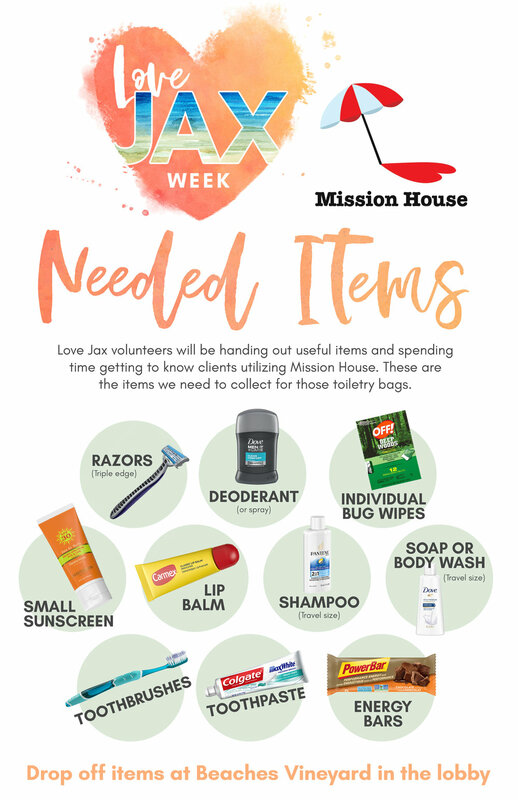 Love Jax volunteers will be handing out toiletry bags and spending time getting to know clients utilizing Mission House; an organization providing food, clothing, and support seven days a week. Two hours before each meal, clients are able to shower (including all toiletry items), get a change of clothing (including undergarments), make a phone call, and use their computer and job board to search for employment. Mission House is located at 800 Shetter Ave, Jacksonville Beach, FL 32250. Sign-Up to volunteer below. Beaches Vineyard Church will be accepting the following items in advance to pass out at the Mission House. Items may be dropped off during office hours Monday – Thursday from 8:30am to 4:30 pm, or during Sunday services. Thank you for joining Love JAX and volunteering to serve at Mission House. As the event draws near the team leader will contact you with more details. Thanks again! The Giving Closet is a non-profit that collects all the unclaimed lost and found clothing in schools and then launders and organizes them to be given to students in need. They are in need of volunteers to help fold and organize clothes. We will be meeting at Martin Luther King, Jr Elementary School at 5:00pm. See you then! If you have any questions, please email Andrew Edwards. Thank you for joining in Love JAX and volunteering to help out at the Giving Closet! As the event nears you will be hearing from the team leader with more details. There's always room for one more volunteer! Love Jax volunteers will be helping to clean up a Reddie Park Preserve in partnership with St Johns Riverkeepers. Gloves, grabbers and trash bags will be provided and there will be a scavenger hunt! You can read about St Johns Riverkeepers here or Reddie Park here. Habitat for Humanity will be hosting a kid's event for the children of volunteers. The kid's event will be at Jordan Park from 8:00-1:00, so people who are volunteering on the construction site have time to drop off/ pick up their kids if they’d like to. People can feel free to drop in – staying for the whole duration isn’t necessary. Teens from Habitat will be helping with supervision and adults are welcome too. Kids will be making housewarming gifts for Habitat families, projects will depend on age, ranging from coloring greeting cards to building small projects (like a tool box). We are so excited and thankful to Habitat for Humanity for setting up this event to help parents who are wanting to volunteer. If yes, please list your child/children and their ages. Thank you! As the volunteer event nears you will be hearing from your team leader with more information. Unfortunately, this event had to be cancelled. Sorry!! This week high school students will be volunteering at The Giving Closet instead of attending their regularly scheduled meeting. All Volunteer Slots Filled - Thank you! Beaches Vineyard Church will be accepting the following donated travel-sized items in advance to prepare the toiletry bags. Items may be dropped off during office hours Monday – Thursday from 8:30am to 4:30 pm, or during Sunday services. Love Jax volunteers will be helping Brother’s Keeper move some heavy items from one storage unit to another, as they prepare for summer. Comfortable clothing and tennis shoes are recommended. A few other items you might want to consider are: a hat, sunscreen, and gloves if you want to protect your hands when lifting heavy objects. Brother’s Keeper is an organization providing food and seasonal needs for the homeless. Email Bobby Spahn with any questions. Love Jax volunteers will join residents for a time of singing together and dessert. No musical talent is required, (lyrics will be provided ahead of time,) just a love for the elderly and a willingness to listen to their stories. This is a great opportunity for families to volunteer together. Each family should bring a dessert to share. Kids are welcome. Also, if you are not able to join us for the singalong, you may drop off a dessert at the church office that Monday between 9:30 and 4:30. If you have any questions, please email Katie Fair. Thank you for volunteering! As the event nears you will be hearing from the team leader with more details.